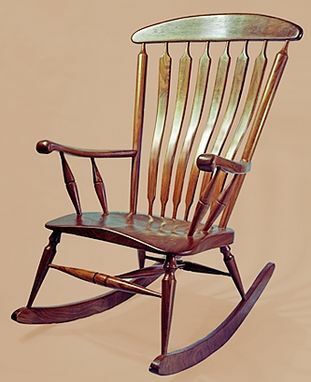 These rocking chairs were designed over a period of many years. 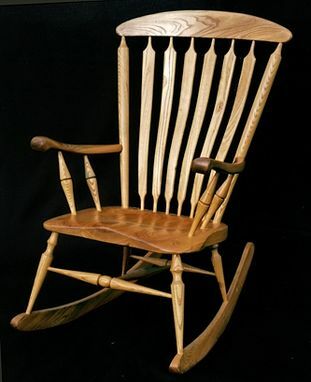 The goal was to build a rocking chair that could be used comfortably for a long period of time. A final successful ergonomic form evolved as I learned through observation and experimentation. Particular attention is paid to the lower back area where the form of the steam-bent back pieces gives excellent lumbar support. I combine this comfort with a design that shows the wood to its best advantage. 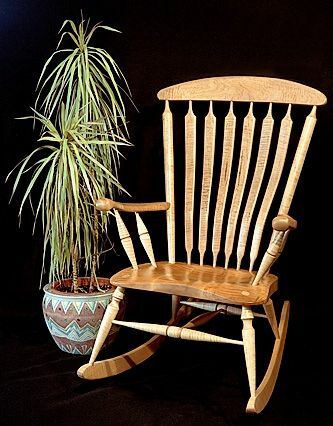 Influenced by various traditional design themes, the result is a sturdy construction and clean, strong look that results in a beautiful heritage rocking chair that will last for generations. 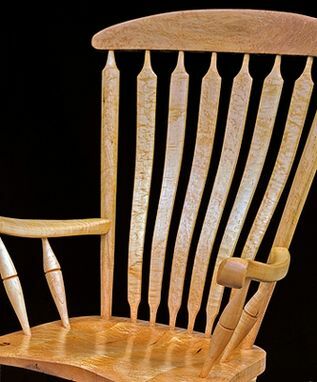 Highly figured Birdseye or Curly Maple is often used. These and other native hardwoods such as Elm, Cherry and Walnut are carefully selected and dried. This drying process takes several years as the wood is moved to progressively drier locations and re-piled and checked for moisture content. The lumber is mostly from local mills and is cut according to my specifications. 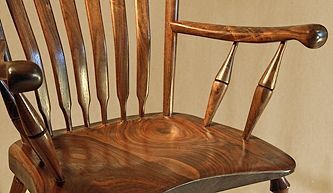 The chairs are constructed using a combination of modern technology and traditional methods, and is meticulously finished. 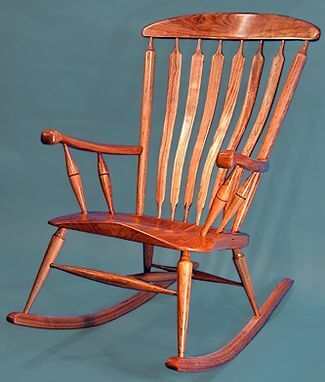 Some of the rocking chair parts are steambent using techniques and equipment that I have developed in my shop. Because the woods can respond differently to the process, each part will be steamed for the optimum time to minimize breakage. The wood is then finished with a hand-rubbed Tung Oil. This protects the wood and enhances the grain. The oil is applied by hand in thin coats and each coat is sanded smooth before the next layer is added. The result is an extremely durable finish that is easily repaired if accidentally scratched.